The information from the location selector is used to set the time zone, but (apparently) also used to set the country, for localization settings. Currently it says "Select your time zone from the map, or by region and city", but selecting the time zone is not enough. The wording should be "Select your location from the map" and it should specify what this is used for, so the user knows they should be specific. I think this location information should also be fed to the "About Me" app, and to the Weather app in the panel clock. That might need a separate bug, though. You are correct Endolith, the separate bug you speak of is Bug #291853 affecting libgweather. It works but it is a little sloppy; I think both of these bugs should be worked on at the same time. >Weather app in the panel clock. That might need a separate bug, though. The user currently has two options. They can either select a time zone location from the map, or alternatively they can select a region and time zone location from the drop down boxes that sit below the map. "Select your location from the map" does not explain the latter option to the user. Why would they select only a region and not a location? Select your time zone from the map, or by region and city. forecasts, daylight saving time, and currency formatting. I'm concerned that your suggested string is too verbose. Keep in mind that any space used by text is taken away from the timezone map, which increases in usability as it gets larger. The fact that it's not scaling to fit the window is a separate bug, which has already been filed. "Why would they select only a region and not a location?" They wouldn't, and the installer will not let them. We chose to split the data into two drop down boxes because there are a large number of time zone cities and users have often complained when these are put in a single drop down box. The boxes exist as a concession to disabled users (the map does not support accessibility or keyboard control yet, and those who find the map difficult to use, which was a common problem with previous iterations of the map. The timezone selector has been a papercut for me for a while. Out of the cities listed on the map, none of the cities listed in my timezone are within a thousand miles from my location, and I live in one of the 10 largest cities in the US (San Antonio). I usually choose Chicago, but a novice user wouldn't know which city to choose if there aren't really any near them, or what time zone cities in Mexico are in (Monterrey is closer than Chicago), or why some of the cities listed are on the border of time zones that don't honor daylight savings time. Note that oem-config and ubiquity are now one in the same. "Select your location from the map, or by region and city below." Changing "time zone" to "location" will encourage users to make a more precise selection, and adding "below" makes it more clear that the "region and city" selection is separate from the map. Users who see the map but do not see the Region and City controls might be confused by "select your time zone... or... region and city." I'll note that the timezone map has changed very recently (not yet even released) to use not quite cities, but 'zone names' -- i.e. translated cities. Where before you'd see Berlin or New York in the City dropdown, now you see Germany or Eastern (translated for the language chosen). In the case where a country has more than one timezone-city, you'd see 'Russia (City 1)' and 'Russia (City 2)'. In the case where a country has zones with non-city names (like the US, Mexico, and Canada), those names are shown. and set the clock to the correct local time." So suggestions on top of these changes are definitely welcome, but just wanted to give a heads up on the new look. Yar, of course not. It uses the translated name of the city in question. Another comment on Step 2 in ubiquity (Where are you? Select your time zone from the map, or by region and city.) I don't personally find clicking on the map as accurate or useful as using the menus. For users who wish to use the region and city menus instead of clicking their city on the map, ubiquity should also allow "searching/skipping" the menus using the keyboard. This way if I click on the City menu and I type in "tor" it will select Toronto as the city. This saves time and is common in other applications. I haven't done a totally fresh install in a while, but I had a situation simiar to comment 7 from Mark McCoy. I live in Duluth, MN, USA and the closest city to me that is in the same time zone is actually in Canada. While I understood at the time I was selecting based on time zone, I didn't expect it to default all of my weather settings to metric... That was something I got over easily as it was easy to change. It took me forever to realize however why my dates were always displayed in a non-US format in OO Calc. It caused a certain amount of problems with some spreadsheets I had to do for work even, as I would type a date such as July 4, as 7/4/09, and it would interpret the date was April 7. I hope the region thing Michael Terry wrote about helps remedy this. What a nightmare! @Endolith: in this case: indeed! There hasn't been any activity on this bug for a while now. There was a suggestion made in comment #9 to change 'time zone' to 'city'. This to me would be an adequate solution to this problem. Is there any disagreement? The attached branch will ask the user to 'enter their town/city, or the closest to their location'. Unassigning myself. I don't have time to work on this. un-subscribing ubuntu-sponsors, I don't think there is enough consensus here to sponsor the branch. The current timezone selector screen asks the question "Where are you? ", nothing more. I guess this should be marked as Invalid or Fix released. 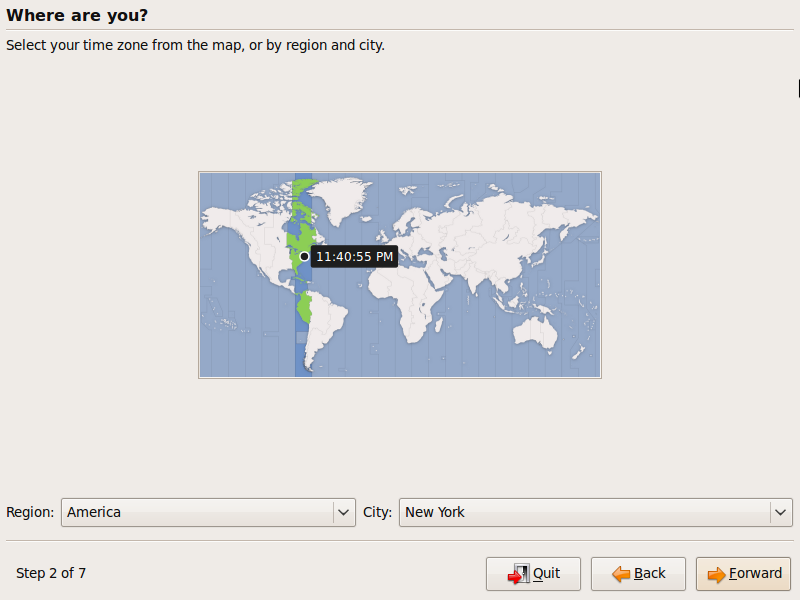 See the screenshot attached of the current timezone selector.